On the afternoon of February 2, Quanar signed an entry agreement with Songshan Lake (Biopark) Administrative Committee. 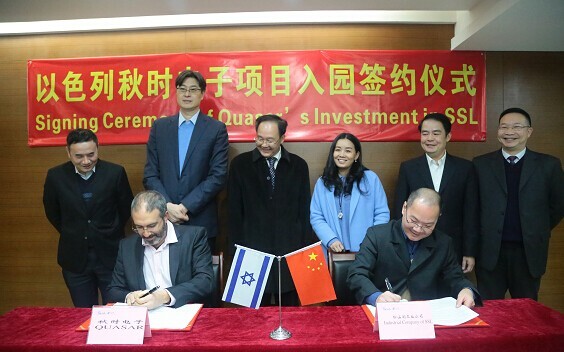 This first Israeli major medical equipment project is expected to be wholly relocated to Songshan Lake and put into production in August 2016. Yin Huanming, secretary of Songshan Lake (Biopark) Party Working Committee and director of Songshan Lake (Biopark) Administrative Committee, and President Amittai of Quanar (Shenzhen) Co., Ltd. attended the signing ceremony. A well-known medical equipment manufacturer from Israel, Quanar founded its wholly-owned enterprise Quanar (Shenzhen) Co., Ltd. in 1992. Manufacturing such leading products as optical instruments, full-auto electronic beautifying devices and medical sensors, Quanar (Shenzhen) Co., Ltd. realized the sales of RMB 156 million in 2014. Now Quanar plans to relocate its Shenzhen base to Songshan Lake with an aggregate investment of RMB 100 million, and put it into production in August 2016. President Amittai of Quanar (Shenzhen) Co., Ltd. revealed his hope that Quanar could grow into the strongest medical equipment manufacturer in Songshan Lake, and develop into a major medical equipment manufacturer in Dongguan and in China at large. This first Israeli major medical equipment project can effectively help gather Israeli projects and extend the industry cooperation from water treatment to biotech and high-end electronics in the Biopark. Such extension can further facilitate investment attraction, expand the investment attraction channels of Israeli projects, and draw more quality high-level Israeli projects and global famous enterprises to Songshan Lake.